The unravelling of the human genome and proteome opens new avenues for defining the complex cellular interactions of the neuroendocrine and immune system, and its relevance for disease. Fig. : Adrenal microenvironment with its different cell types: the interactions thereof are important mechanistic components during adrenal (dys)function. The involved researchers in our group have complementary expertise in each of the cellular compartments. Defining basic mechanisms and clinical implications of cellular crosstalk in endocrine tissues. We analyse, in a comprehensive manner, the components and mechanisms of this cellular crosstalk by defining the involved receptors, signalling pathways, transcription factors and gene expression profiles. Using the adrenal gland as a model we have demonstrated that tissue integrity, input from the nervous system or intercellular communication is essential for the normal functioning of the gland and the adequate respond to the homeostatic challenges of stress. We have demonstrated that intact intraglandular cellular interactions are required for normal development, differentiation and zonation of the adrenals and that alterations in intercellular communication, local production of neuropeptides, growth factors and cytokines, and aberrant expression of ectopic receptors are implicated in adrenal hyperplasia, autonomic hormone production and tumour formation. Overweight and obesity and diabetes are increasing at an alarming rate worldwide, reaching alarming epidemic proportion in the westernized world. Obesity is the major risk factor for lipid abnormalities, atherosclerosis, high blood pressure, diabetes mellitus type 2 and certain types of cancer. It is well established now that adipose tissue, besides its role in the deposition and release of fatty acids, is a highly active endocrine organ. We are interested in this endocrine function of adipose tissue and its involvement in the development of obesity associated diseases, especially the influence on the stress system, myocardiocytes and pancreatic beta-cells. We have developed new strategies for the regeneration of metabolic disease and the cure of diabetes. We are the only active centre for islet TX in Germany testing new replacement strategies. Based on our previous findings we will use integrated approaches in both research areas using a wide array of techniques. This is a logical consequence of our previous work and a translation of basic science into regenerative and clinical medicine. How is cellular crosstalk reflected in the process of development and stem cell biology? How does systemic inflammatory diseases e.g. sepsis influence intraadrenal cellular crosstalk? What can we learn from transgenic animal models? New therapeutic strategies based on a thorough understanding of this form of integrative medicine. Ludwig B, Ludwig S, Steffen A, Knauf Y, Zimerman B, Heinke S, Lehmann S, Schubert U, Schmid J, Bleyer M, Schönmann U, Colton CK, Bonifacio E, Solimena M, Reichel A, Schally AV, Rotem A, Barkai U, Grinberg-Rashi H, Kaup FJ, Avni Y, Jones P, Bornstein SR. Favorable outcome of experimental islet xenotransplantation without immunosuppression in a nonhuman primate model of diabetes. Proc Natl Acad Sci U S A. 2017. 114:11745-11750. Balyura M, Gelfgat E, Ullmann E, Ludwig B, Barnea ER, Bornstein SR. PreImplantation Factor (PIF*) Regulates Stress-Induced Adrenal Steroidogenesis and Anti-Inflammatory Cytokines: Potential Application for Bioartificial Adrenal Transplant. Horm Metab Res. 2017. (Ahead of print). Alexaki VI, Fodelianaki G, Neuwirth A, Mund C, Kourgiantaki A, Ieronimaki E, Lyroni K, Troullinaki M, Fujii C, Kanczkowski W, Ziogas A, Peitzsch M, Grossklaus S, Sönnichsen B, Gravanis A, Bornstein SR, Charalampopoulos I, Tsatsanis C, Chavakis T. DHEA inhibits acute microglia-mediated inflammation through activation of the TrkA-Akt1/2-CREB-Jmjd3 pathway. Mol Psychiatry. 2017 (Ahead of print). Kanczkowski W, Sue M, Bornstein SR. 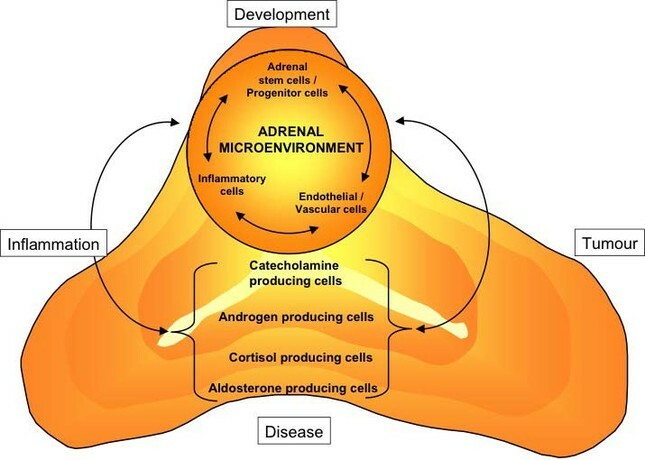 The role of adrenal microenvironment in health, disease and during regeneration. Hormones. 2017 (Ahead of print). Steenblock C, Rubin de Celis MF, Androutsellis-Theotokis A, Sue M, Delgadillo Silva LF, Eisenhofer G, Andoniadou CL, Bornstein SR. Adrenal cortical andchromaffin stem cells: Is there a common progeny related to stress adaptation? Mol Cell Endocrinol. 2017. 441:156-163. Langton K, Gruber M, Masjkur J, Steenblock C, Peitzsch M, Meinel J, Lenders J, Bornstein S, Eisenhofer G. Hypertensive crisis in pregnancy due to a metamorphosing pheochromocytoma with postdelivery Cushing's syndrome. Gynecol Endocrinol. 2017 Sep 22:1-5. Ullrich M, Bergmann R, Peitzsch M, Zenker EF, Cartellieri M, Bachmann M, Ehrhart-Bornstein M, Block NL, Schally AV, Eisenhofer G, Bornstein SR, Pietzsch J, Ziegler CG. Theranostics. 2016. Jennewein C, Tran N, Kanczkowski W, Heerdegen L, Kantharajah A, Dröse S, Bornstein S, Scheller B, Zacharowski K. Mortality of Septic Mice Strongly Correlates With Adrenal Gland Inflammation. Crit Care Med. 2016. 44:e190-9. Rubin de Celis MF, Garcia-Martin R, Wittig D, Valencia GD, Enikolopov G, Funk RH, Chavakis T, Bornstein SR, Androutsellis-Theotokis A, Ehrhart-Bornstein M. Multipotent glia-like stem cells mediate stress adaptation. Stem Cells. 2015. 33:2037-51. Balyura M, Gelfgat E, Ehrhart-Bornstein M, Ludwig B, Gendler Z, Barkai U, Zimerman B, Rotem A, Block NL, Schally AV, Bornstein SR. Transplantation of bovine adrenocortical cells encapsulated in alginate. Proc Natl Acad Sci U S A. 2015. 112:2527-32. Kanczkowski W, Sue M, Zacharowski K, Reincke M, Bornstein SR. The role of adrenal gland microenvironment in the HPA axis function and dysfunction during sepsis. Mol Cell Endocrinol. 2015 . 408:241-8. Lamounier-Zepter V, Look C, Schunck WH, Schlottmann I, Woischwill C, Bornstein SR, Xu A, Morano I. Interaction of epoxyeicosatrienoic acids and adipocyte fatty acid-binding protein in the modulation of cardiomyocyte contractility. Int J Obes (Lond). 2015. Ullrich M, Bergmann R, Peitzsch M, Cartellieri M, Qin N, Ehrhart-Bornstein M, Block NL, Schally AV, Pietzsch J, Eisenhofer G, Bornstein SR, Ziegler CG. In vivo fluorescence imaging and urinary monoamines as surrogate biomarkers of disease progression in a mouse model of pheochromocytoma. Endocrinology 2014. 155:4149-56. Steenblock C, Heckel T, Czupalla C, Espírito Santo AI, Niehage C, Sztacho M, Hoflack B. The Cdc42 guanine nucleotide exchange factor FGD6 coordinates cell polarity and endosomal membrane recycling in osteoclasts. J Biol Chem. 2014. 289:18347-59. Ziegler CG, Ullrich M, Schally AV, Bergmann R, Pietzsch J, Gebauer L, Gondek K, Qin N, Pacak K, Ehrhart-Bornstein M, Eisenhofer G, Bornstein SR. Anti-tumor effects of peptide analogs targeting neuropeptide hormone receptors on mouse pheochromocytoma cells. Mol Cell Endocrinol. 2013. Kanczkowski W, Tymoszuk P, Ehrhart-Bornstein M, Wirth MP, Zacharowski K, Bornstein SR. Abrogation of TLR4 and CD14 expression and signaling in human adrenocortical tumors. J Clin Endocrinol Metab. 2010.95:E421-9. Ziegler CG, Brown JW, Schally AV, Erler A, Gebauer L, Treszl A, Young L, Fishman LM, Engel JB, Willenberg HS, Petersenn S, Eisenhofer G, Ehrhart-Bornstein M, Bornstein SR. Expression of neuropeptide hormone receptors in human adrenal tumors and cell lines: antiproliferative effects of peptide analogues. Proc Natl Acad Sci U S A. 2009 . 155:4149-56.